Each year in El Paso, some 25,000 dogs, cats, puppies and kittens are killed at Animal Services for lack of a home. At the root of this problem is a large population of unsterilized dogs and cats producing puppies and kittens faster than our community can absorb them. Some pet owners do not spay and neuter their pets because they wish to breed them, or because they view sterilization as unnatural or unnecessary. Other pet owners are willing to spay and neuter their pets but haven't yet gotten around to it for one reason or another, risking an oops litter in the meantime. There is also a large group of pet owners who would happily spay and neuter their pets today, but who cannot afford to do so. And finally, we know that the vast majority of unsterilized cats in El Paso are stray and feral cats whom people feed but do not feel any real sense of ownership towards. Pets Alive-El Paso works to reduce the number of unsterilized dogs and cats in El Paso, primarily through programs focused on animals in the latter two groups: pets whose owners would like to have them spayed or neutered but can't afford to do so, and feral cats, who have no owners to have them spayed or neutered. Through our spay/neuter voucher program, we provide free spay/neuter surgeries for dogs and cats of low-income El Paso area residents. Funding for this program comes primarily from City and State contracts, with a smaller amount of money coming from foundation grants, fundraising revenue, and private donations. By reducing the number of unspayed and unneutered dogs and cats in El Paso, we are working toward a day when every animal who needs a home will find one. 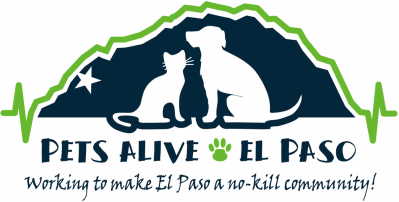 We are working — surgery by surgery -- to make El Paso a no-kill community! For more information, click on a link! How do I apply for a spay/neuter voucher? I want to help! How do I make a donation?